Exor accreditation services bring buyers and sellers together in the most effective way. Exor implement a rigorous programme of conformity that verifies suppliers on a wide range of compliance issues including health and safety, finance, quality and the environment. 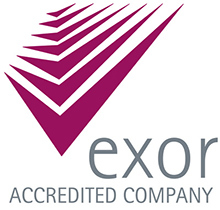 'We are delighted with this formal recognition from Exor. It is a reflection of the commitment of all our team to providing high quality services yet with a flexible, customer focused approach.' says Peter Heming.